In this Part, we describe agreements under which Waitakere City Council agreed to pay Transpower to relocate the power lines affecting the development area and recover a portion of the costs from NZRPG. the negotiation of an agreement for the relocation works. There were two main agreements – a Line Deviation Agreement (between Waitakere City Council and Transpower New Zealand Limited) and a "back-to-back" cost recovery agreement, referred to as Works Development Agreement 2 (between Waitakere City Council and NZRPG). Transpower owned the transmission power lines, which ran the length of the Plan Change 15 development area, from north to south. These power lines were to be relocated underground before any significant development in the Plan Change 15 area could begin. Under the Infrastructure Funding Agreement, Waitakere City Council and NZRPG had agreed that they would "cooperate with each other in their efforts to persuade Transpower to agree to all matters necessary to facilitate the replacement of the existing overhead transmission lines over NZRPG land with an underground installation". Figure 4 shows the location of the overhead power lines. The documents available to us do not provide a complete record of the history of discussions between Waitakere City Council, NZRPG, and Transpower about the transmission lines. However, we set out our understanding of this history in the following paragraphs. In 2008, NZRPG commissioned an investigation into possible options for new locations and construction types (underground or overhead) for the line. That report presented a range of options. After discussions between Transpower, Waitakere City Council, and NZRPG, the preferred option was to place the transmission lines from tower 6 to tower 12 underground, by relocating them principally along the main street of the proposed new town. The November 2008 paper officials presented to the Council when outlining NZRPG's proposal that the Council buy land for roading and other infrastructure assets referred to the transmission lines. Officials commented at the time that acquiring the land might enable the Council to help find a resolution to the relocation of the power lines. The next reference to the transmission lines is in the April 2009 report to the Council about acquiring Westgate Street. During the discussion about the terms of that acquisition, it had been found that a power pylon was possibly located on land the Council was considering buying. Officials were concerned that, if the power pylon was on NZRPG-owned land, it might affect the value of the land. If the Council bought the land, it might get drawn into the costs of funding the relocation, which, at that stage, was expected to cost about $10 million. From the records we have seen, the next month, on 12 May 2009, Waitakere City Council and NZRPG met with Transpower and the New Zealand Transport Agency to agree on the route for the underground line for the purposes of a technical and cost study. 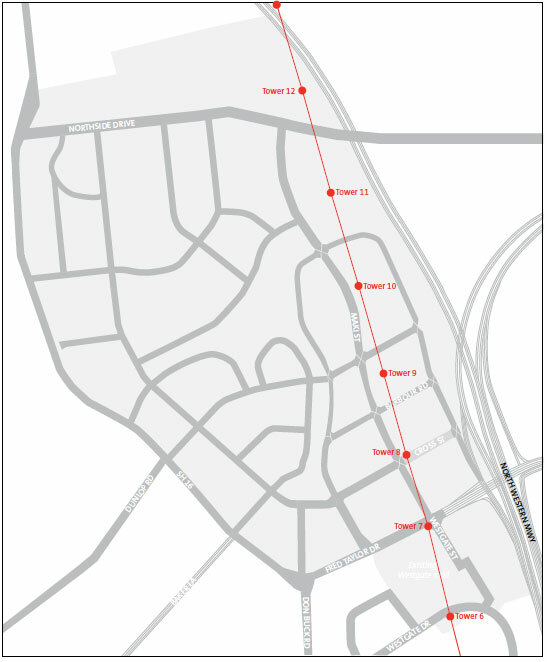 It was agreed that the underground line would go from tower 6 on Westgate Drive to tower 11 to the north of Northside Drive. It was recorded that the study was due to be completed by 31 July and would be carried out by Transpower's consultants. It was also recorded that Transpower had estimated that the design work would take seven months and the construction would take 1½-2 years. The next day, on 13 May 2009, Waitakere City Council met separately with Transpower to discuss the commercial agreements and funding for the relocation of the power lines. According to the minutes of that meeting, the Council's Chief Executive spoke about the Council's desire to facilitate development at Westgate and asked about the possibility of Transpower providing some form of contribution to the cost. According to the minutes, Transpower advised that the likely cost at that stage was about $3 million per kilometre, plus the cost of "termination structures" which was likely to be about $500,000. Transpower agreed to investigate the supply of cable. We have seen evidence that, in June 2009, NZRPG entered into an agreement with Transpower for "detailed solution development" in relation to relocating the transmission lines underground. The contract involved conceptual design, the assessment of project risks and the potential cost impact of those risks, preparation of a cost estimate, and a proposed project programme. NZRPG would be charged only for the work between towers 6 and 11. The additional cost for work between towers 11 and 12 would be resolved between Transpower and the Council. We have been told the reason for the work between towers 11 and 12 was because Northside Drive had to be quite high to cross over State Highway 16 and overhead lines would be too low for the safe operation of the new road. In October 2009, there was an exchange of letters between Transpower and NZRPG about the contract they had entered into in June 2009 for the initial design and project planning work. It appears from those letters that Transpower was refusing to continue work under the contract because of a dispute with NZRPG. After October 2009, there is a gap in the information available to us until May 2010, when Council officials reported that Transpower's estimated cost had gone up from $8 million to $16 million. It was reported that the Council was going to take over the design contract from NZRPG "to speed things up". On 12 May 2010, the Council and Transpower entered into an agreement referred to as the Agreement for Detailed Solution Development in New Zealand – Stage II: ALB-HEN A Undergrounding at Massey North. By July 2010, the Council, Transpower, and NZRPG were negotiating the contracts for the relocation works. The proposal was that the Council would enter into the agreement with Transpower and accept the primary payment obligation. The Council and NZRPG would then enter into an agreement at the same time, under which NZRPG would reimburse the Council for costs the Council incurred on NZRPG's behalf under the relocation agreement. It is not clear from the papers what discussions the parties had about splitting costs, but it appears there were at least two separate lines of discussion. One proposed a split on the basis that the Council would pay 25% and NZRPG would pay 75% of the costs. This was on the basis that the overhead lines were 2.4km long and that they crossed 1.8km of land that NZRPG would own and 0.6km of land that Waitakere City Council would own. Another approach suggested that a quantity surveyor should make the final determination, although it was not clear on what basis. The parties also discussed options for securing NZRPG's payment obligations. It was agreed that the Council would have a right of set off – that is, if NZRPG's payments were overdue, the Council could deduct any amount NZRPG owed from any amount the Council owed NZRPG (for example, under the Infrastructure Funding Agreement). It was also agreed that the Council would seek to take a first ranking security over NZRPG land, before the existing first ranked security holder. the Council paying all costs (including contractors' and internal costs) incurred by Transpower in relocating the line. The total budgeted costs were $17,829,675, but the actual costs payable could be more or less than this amount. The Agreement specified the procurement process to be applied by Transpower, and a cost monitoring regime, to limit the extent to which the budget might be exceeded. Officials said that it was essential to conclude the Line Deviation Agreement with urgency to procure the necessary cabling and negotiate physical works contracts by Transpower to ensure completion by the end of the 2011/12 construction season. Transpower agreed to relocate the power lines that passed over the development in Precincts A and B of Westgate Town Centre. The line was to be routed under all of the proposed Council roads in the town centre, including Westgate Street. It was estimated the work would cost about $17 million. The Council was required to pay these costs as they were incurred. The Council was required to meet the first $2 million of the cost. The Council effectively made this payment on behalf of the third landowner affected by the relocation, whose land the Council was in the process of acquiring under the Public Works Act 1981. The payment was in lieu of payment for the land. The balance of the costs was to be shared between the Council and NZRPG. The Council would pay 35% of the costs. NZRPG would pay 65%. NZRPG was required to reimburse the costs the Council paid on its behalf under the Line Deviation Agreement. This arrangement was set out in a separate agreement between NZRPG and the Council referred to as Works Development Agreement 2 (see paragraphs 6.30-6.34). As security for NZRPG's obligations, the Council had a "right of set-off" for any money it was owed by NZRPG (that is, if NZRPG did not pay an amount owing under the Line Deviation Agreement, the Council could deduct that amount from any amount the Council owed NZRPG under other agreements). NZRPG was also required to use "best endeavours" to put in place a first ranking security to secure its payment obligations. At the same time as approving the Line Deviation Agreement, Waitakere City Council was asked to approve the back-to-back agreement between the Council and NZRPG under which NZRPG agreed to reimburse the Council for its share of the costs of relocating the power lines. This Agreement was referred to as Works Development Agreement 2. The purpose of the Works Development Agreement was to ensure that a mechanism was in place, either before or at the same time as signing the Line Deviation Agreement, to ensure that the Council would be in a position to recover NZRPG's share of the costs of relocating the power lines. At several points, Council records stress that, to properly protect the Council, the back-to-back agreement had to be entered into before the Line Deviation Agreement or that both had to be entered into at the same time. This was to ensure that the Council was not left exposed by having a payment obligation to Transpower without a corresponding payment obligation from NZRPG to the Council. The Line Deviation Agreement was approved on 29 September 2010 and signed on 29 October 2010. Works Development Agreement 2 was approved on 29 September 2010 and signed on 28 October 2010. However, although the Auckland Transition Agency approved the Line Deviation Agreement, it did not approve Works Development Agreement 2. It is not clear from the Council's records why the Auckland Transition Agency approved one agreement but not the other. In Part 8, we discuss the implications for Auckland Council and the steps the Council took.